Every year along the banks of the Ohio River, Cincinnati hosts a huge book festival. Well actually, it’s downtown in the convention center, so it’s literally closer to banking institutions than to the river banks, nevertheless it’s an event you can bank on every year! And every year, I meet more new and wonderful people – authors, illustrators, teachers, librarians, parents, kids, friends, volunteers. This year I attended a panel of ‘authorstrators’, author/illustrators. These talented people both write and illustrate. I was inspired by Loren Long, Rafel Lopez, Ben Clanton, and Amanda Driscoll. Look at this small sample of their work. Amazing! Each artist has his/her distinct style. Without looking at the names or even knowing the artists, I’m sure you could group these books into four piles based solely on the art. These books present readers both windows and mirrors to see themselves and others in literature. Of the many things discussed, I think the key message is to be fresh, different, unique, and true to yourself. I was particularly in awe meeting Rafel Lopez. He spent several minutes talking with me even though there were other people in line waiting to meet him. We discussed his work, and the importance of bringing diverse books into the world. He chuckled with me at the trouble I sometimes have convincing people I am spanish because I don’t fit their stereotype. And he encouraged me to continue writing and submitting. “There is a place for all our work,” he told me. I will treasure my copy of Maybe Something Beautiful which he autographed for me. And then, I had the pleasure of listening to the award winning author and National Ambassador for Young People’s Literature, Kate di Camillo speak. I just wanted to curl up and never leave her funny, warm, human spirit. She spoke directly to my writer’s heart and my reader’s soul. She talked about connections, about making connections with the world around you and writing toward the connections with others. She also talked about keeping everything open so you don’t miss a thing. Keep your eyes and ears open. Keep your heart and mind open. Keep your brain open. Allow creativity to find you and inspire you to write, or draw, or dance, or sing, or do whatever it is that connects you to the world outside yourself. Even though the line was looooooooong, she took a moment to look up and smile for each and every fan wanting a picture taken with her. What a genuine kind person she is! And last, but not least, I took a few minutes to stop by the bookmobile parked outside the front doors of the convention center. Actually, the bookmobile is part of my former school district and I wanted to pop in and say ‘HI’ to the wonderful folks who work tirelessly to put books into kids’ hands. There is no checkout system. Kids are free to browse the shelves, sit and read, and take home any book that speaks to them. They don’t even have to live in our district. Our librarian was calling out to families passing by, “Come on in. Pick a book to take home.” And they did. They climbed up the steps to the brightly painted, remodeled school bus, designed by nationally renown author/illustrator Loren Long, into the inviting reading space filled with books, stuffed animals, cushioned benches, and friendly faces of Princeton City School employees. My heart was bursting to see the happiness a few pages could bring to those kids and their parents. If you have any gently loved children’s books laying about the house, please consider a donation to this or many other organizations in your neighborhood. Many folks remake classic stories, fairy tales, and songs. Last year I wrote a little story to go along with the classic Who Took the Cookies from the Cookie Jar song and hand play kids love. I took it to a new critique group last month to get a new perspective on it. Lo and behold, one of my critique partners had just read something similar to her preschooler that week! At first I was bummed, it’s been done. But then I got a copy of the book she read, Who Took the Cookies from the Cookie Jar? written by Bonnie Lass and Philemon Sturges and illustrated by Ashley Wolff. The story is clever and the artwork adorable! Skunk finds the cookie jar empty and begins the search for who took the cookies. With only a trail of cookies crumbs to follow, Skunk begins the search. On each page Skunk finds a clue leading her to believe she knows the culprit with the refrain kids will join in saying, “Mmm…Oh! Now I know…”. But each guess is incorrect and the accused has a catchy little rhyme explaining why it isn’t them. Eventually the trail of cookie crumbs leads to the guilty party. Luckily there’s plenty of cookies left and everybody shares in the cookie feast! I’m so glad I didn’t give up without reading the book. First of all, I love finding new and wonderful children’s literature to share with my family and friends. Secondly, I can see that this has genuine kid appeal. Thirdly, although both my story and this one are based on the same premise, I believe mine is different enough to be unique in the market. (fingers crossed) And, bonus… this version was published in the year 2000, so I figure it’s been long enough between stories to hit a new generation or two of young readers. (toes crossed) Now I just have to convince my agent and future editor! A picture book is awarded the most outstanding contribution to children’s literature, the John Newbery Medal winner is https://julianaleewriter.com/books-alive/l/last-stop-on-market-street/ by Matt de la Pena and Christian Robinson. A 56 page story is awarded the most distinguished American picture book for children, the Randolph Caldecott Medal winner is https://julianaleewriter.com/books-alive/f/finding-winnie/ by Lindsay Mattcik and Sophie Blackall. An autobiography and ‘celebrity’ picture book is awarded The Coretta Scott King (Illustrator) Book Award. The winner is https://julianaleewriter.com/books-alive/t/trombone-shorty/ by Troy Andrews and Brian Collier. This is the first time in the history of the ALA Youth Media Awards that the same person won both the Laura Ingalls Wilder Award and the Virginia Hamilton Award for Lifetime Achievment in the same year. Congratulations to Jerry Pinkney! Pinkney’s newest picture book this year was https://julianaleewriter.com/books-alive/g/the-grasshopper-and-the-ants/. Other picture books taking home ALA awards this year are…. Emmanuel’s Dream by Laurie Ann Thompson and Sean Qualls won the Schneider Family Book Award for books that embody an artistic expression of the disability experience. The Wonderful Fluffy Little Squishy by Beatrice Alemagna won the Mildred L. Batchelder Award for an outstanding children’s book translated from a foreign language and subsequently published in the United States. Drum Dream Girl by Margarita Engle and Rafael Lopez won the Pura Belpré (Illustrator) Award honoring a Latino writer and illustrator whose children’s books best portray, affirm and celebrate the Latino cultural experience. Funny Bones by Duncan Tonatiuh won the Robert F. Sibert Informational Book Award for most distinguished informational book for children. https://julianaleewriter.com/the-cybils-2015/easy-readers/dont-throw-it-to-mo/ by David A. Adler and Sam Ricks won the Theodor Seuss Geisel Award for the most distinguished beginning reader book. The library and bookstore shelves have been looking very festive for quite a while now. Many are filled with classics we still adore… A Christmas Carol, How the Grinch Stole Christmas, The Polar Express, Rudolph the Red Nosed Reindeer, and T’was the Night Before Christmas, to name a few. But right up front you’ll find the pick of the season… the brand-new releases. Browse the titles. Drink in the artwork. Taste the flavor of the text. I bet you’ll go home with one or two new favorites this year. Below are six new picture books I summarized for you, along with a few fun activities you can do with your little readers for each story. Be sure you click on the title of each one for the link to that page. 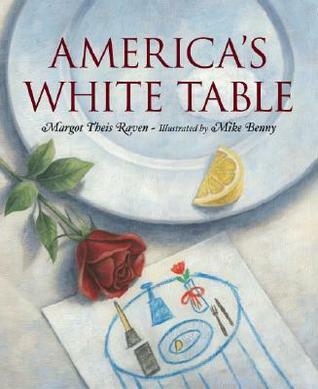 A beautifully told story of the white table which is set for one person, one who will not be attending dinner. This table is set in many home across the country and in every mess hall in the Army, Air Force, Navy, and Marine Corp since the Vietnam War ended. It is set for those men and women who are Missing in Action or Prisoners of War. Each item on the table is symbolic, a lemon slice and grains of sand for a soldier’s bitter fate and the tears of their families, a white candle for peace and a red rose for our hope in their return. This is the story of a little girl who learns the meaning of the table from her mother and her Uncle John who served in Vietnam. Margot Theis Raven’s words are powerful. In just a few short pages, she delivers the message of ‘a little white table’ and what it means to thousands of Americans. Look carefully at each page, on several spreads are the lines to the first verse of ‘America – My Country ‘Tis of Thee’ written in ghost-like print across the text and illustrations. Mike Benny leaves images in our minds just as powerful as the words. You can see the love and pride, sorrow and pain in the faces of the characters. The images of Vietnam are done in sepia color and transport the reader to another day and age. This is one of my favorite books celebrating Veterans’ Day. I like to read it for just about any patriotic holiday. But if you’re like me, you won’t be able to read it with dry eyes. Admit it, we’re drawn to the art of picture books. It’s okay, we’re supposed to be! The artwork sets the stage for the story. It reflects the mood of the story. It provides another layer to the story. Based on those three things alone, it’s okay to judge a book by its cover. And once you open the cover, you will be amazed that such art is within its pages. Another lovely reason to love picture book covers, is the immediate recognition we have when we see a book we know and love. When I taught emergent readers many years ago, we began the school year with a bulletin board of words they could ‘read’ by picture/logo association. These included words from traffic signs, chain stores, restaurants, product trademarks, etc. Advertising people know the power of visual memory. As soon as they started bringing in cereal boxes and magazine ads for our bulletin board, I started showing them book covers. Yes, they could ‘read’ titles based on the artwork. Wow! What a revelation for them… they were readers! They could read caterpillar and moon long before they could read sight words like is, the, and a.
I wish I could afford original kidlit artwork. But like any masterpiece, they are well outside my budget. What I have done, however, is the second best thing for me. I frame the paper covers of my books. I only wish I had thought of doing this earlier, because most of my covers are now tattered or discarded. This is an inexpensive way for me to surround myself with the masters. I have a few Caldecott Medal Winners and some classics. I started with the two or three which survived the many years of love and handling. Then I picked up a few more at Half Price Bookstore. Now, I’m raiding my grandchildren’s shelves. My collection is growing and I love how this is turning out. Can’t wait to pick up and frame more favorite friends. 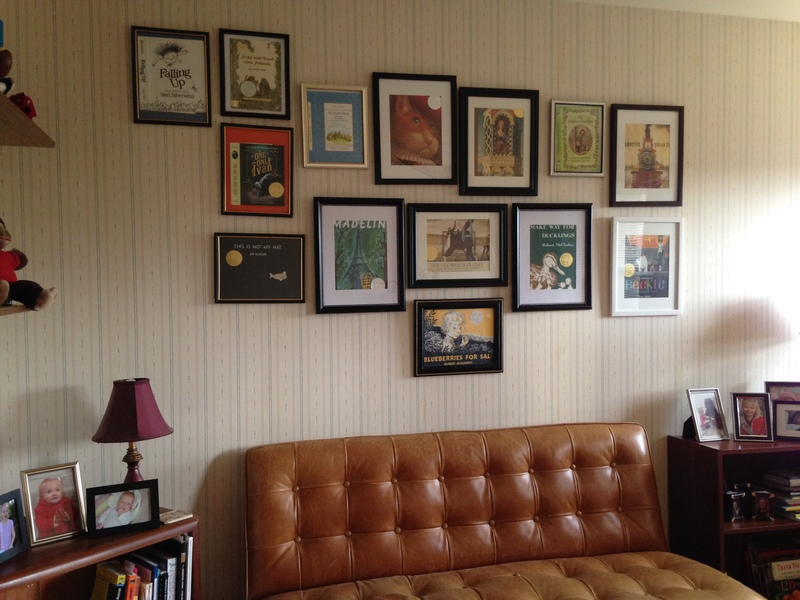 Having picture book covers on my wall is inspirational for me as a writer as well. I can imagine what my own words will look like to an illustrator, and how readers will be drawn to my stories. I can’t wait for the surprises that an illustrator will bring to my stories. And more than anything, I can’t wait for a child to identify my book by its cover! This classic story was first published over 35 years ago and will be reintroduced in an expected 2015 publication. Baby Bear wants to make Papa a cake at the beach. Papa promises to eat it if Baby Bear uses eggs, milk, and flour to make it. Baby When he can’t do it, Baby Bear asks Papa Bear if he can make one. He promises to eat it because he doesn’t think it can be done. But Papa Bear makes a sand cake by drawing eggs, flour, and milk in the sand and then scooping the ingredients into Baby Bear’s bucket. 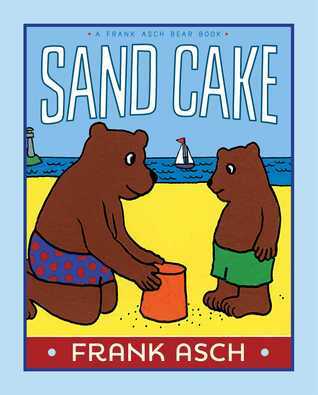 While Baby Bear and Papa Bear float in the water, the cake is baking in the oven Papa Bear has drawn in the sand. When it’s ready to eat, Baby Bear draws a picture of himself in the sand around the sand cake. Now, it’s Papa Bear who is surprised and gives Baby Bear a huge hug. Then they both sit down to eat some of Mama Bear’s cake made from real eggs, milk, and wheat. Frank Asch is the author of over 60 of children’s books. 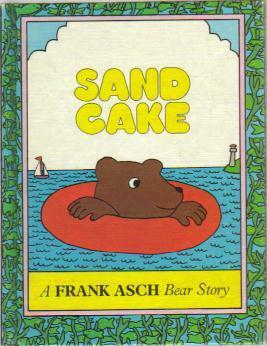 Sand Cake is one of many Baby Bear stories. It is a simple, yet treasured children’s picture book. The text is easy to read and the illustrations are endearing. I have read and loved Baby Bear books since my own children were babies, and my classroom always had a collection of Baby Bear books for independent reading. I know from first hand experience how much children love Baby Bear. And I am so excited to see a new publication of Sand Cake coming out next year. It is sure to capture the hearts of the next generation of readers!